If there's one thing every Photoshop user wants to know, it's how to select someone's hair in a photo. In earlier versions of Photoshop, selecting hair was the kind of thing that separated the pros from everyone else, requiring advanced knowledge of color channels, confusing commands like Calculations and Apply Image, fancy blending options, and even painting individual strands of hair into the image by hand! 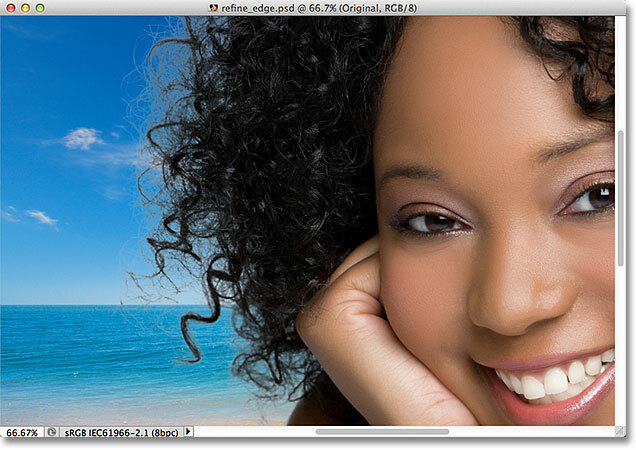 It's no wonder most Photoshop users avoided selecting hair at all cost. In Photoshop CS3, Adobe introduced the Refine Edge command, offering us a first glimpse of how much easier it could be to select hair, fur and other fine details in an image. 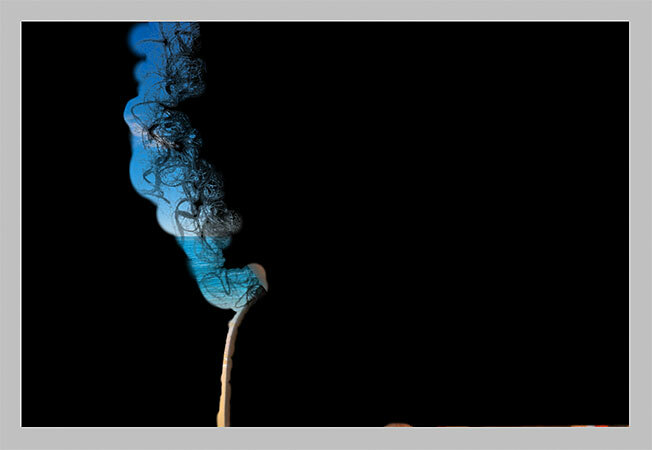 But in Photoshop CS5, Adobe gave the Refine Edge command a major overhaul, with enough improvements and new features to make selecting hair in a photo easy enough for anyone to do! Hairs... I mean, here's, how to do it! This tutorial is fro our How to make selections in Photoshop series. Clicking on the top layer's visibility icon. Clicking with the Polygonal Lasso Tool along the inner edge of her arm and shoulder. Keeping the selection outline away from areas where the background is showing through the hair. A rough selection outline now appears around the woman in the photo. Making sure the correct layer is active (highlighted in blue). Clicking on the Refine Edge button in the Options Bar (with a selection tool active). The document window showing the selection in front of a white background. A small preview thumbnail shows the current view mode. Choosing the On Black view mode from the list. The selection now appears against black after choosing the On Black view mode. Choosing the Black & White view mode. 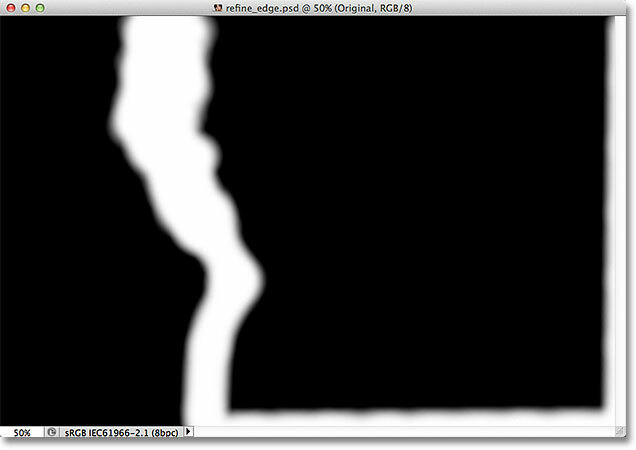 The Black & White view mode shows the image as it would appear as a layer mask. Choosing the On Layers view mode from the list. 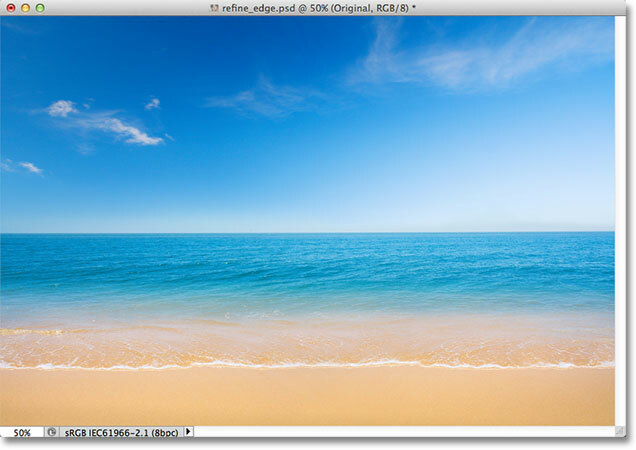 The image with the On Layers view mode selected. I purposely skipped over the first two view modes - Marching Ants and Overlay - because neither of them is all that useful. The Marching Ants mode will show the standard selection outline, while the Overlay mode will display the non-selected area as a translucent red overlay similar to how the selection would appear in Quick Mask mode. We'll look at the last view mode in the list - Reveal Layer - a bit later. The purpose of these different view modes is to make it easier for us to judge our selection as we're refining it. With some images, the selection may be easier to see against white, others against black, and so on. Often, we'll need to jump between view modes as we're working, which is why you may have noticed that each of the view modes in the list has a letter to the right of its name. The letter is the keyboard shortcut for quickly switching between view modes, and they're handy to know. For example, you can switch to the On White mode by pressing the letter W on your keyboard, the On Black mode by pressing the letter B, the On Layers mode by pressing the letter L, and so on. You can also press the letter F repeatedly to cycle between the view modes. If you prefer to select your view modes from the list rather than with keyboard shortcuts, make sure you double-click on the name of the mode. This will select the view mode, then close out of the list. Click and drag the Radius slider towards the right. Some of the hair outside the initial selection is now visible. Dragging the Radius slider even further. The image after increasing the Radius value. Selecting the Show Radius option. With this option enabled, we can actually see the radius in the document window. The way the Refine Edge command works is that it looks around the edge of our initial selection to decide what else needs to be included in the selection, and the Radius value controls how far away from our initial selection edge that Photoshop will look. It doesn't look across the entire image. It only looks within the distance we specify. That's why the Radius value is measured in pixels (px). If we set the Radius value to, say, 50 pixels, Photoshop will look 50 pixels in either direction of our initial selection edge to determine if there's anything else within this area that should be included in our selection. The Radius appears between the areas of solid black. Viewing the radius using the Black & White view mode. I'll switch back to the On Layers view mode by pressing the letter L on my keyboard. 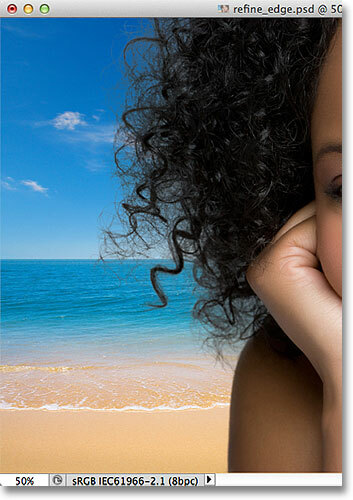 The hair needs a wide radius, but other areas do not. 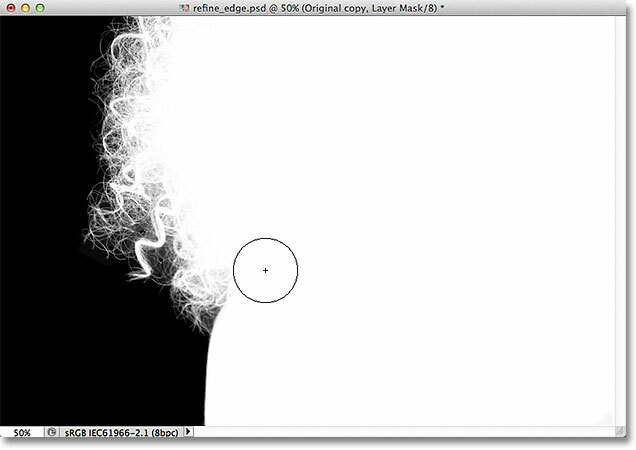 With Smart Radius turned on, Photoshop can adjust the width of the radius in different areas. A quick note about Smart Radius before we continue. Depending on your image and the type of edge you're working with, Smart Radius can help or it can make things worse. A general guideline with Smart Radius is that it tends to help with selections that contain different types of edges, as in my case here. If, on the other hand, you're only selecting hair and nothing else, or only selecting smooth edges and nothing else, you'll probably find that you're better off leaving Smart Radius disabled. Of course, it's easy to select it and then decide if things look better or worse, but don't think you need to use the option just because it's there and it has "Smart" in the name. There are other ways to adjust the size of the radius, as we're about to see! Click and hold on the brush icon to access the radius refinement tools (brushes). The names can be a bit confusing, so you may find it helpful to think of the Refine Radius Tool as the Add to Radius brush and the Erase Refinements Tool as the Subtract from Radius brush. Adobe calls them "Tools" but they behave exactly like brushes, allowing us to simply paint over the areas in the image where we need to add to, or subtract from, the existing radius. By default, the Refine Radius Tool is already selected for us because that's the one we use the most, so there's no need to actually select it from the list. There's also no need to select the Erase Refinements Tool from the list because at any time, we can temporarily switch from the Refine Radius Tool to the Erase Refinements Tool simply by pressing and holding the Alt (Win) / Option (Mac) key on the keyboard. When you release the Alt / Option key, you'll switch back to the Refine Radius Tool. In other words, you'll never need to select either tool from the dialog box, so you can safely forget all about that brush icon. Before I try to add more of the woman's hair to my selection, I'm first going to use the Erase Refinements Tool to remove the unwanted radius area from the bottom of my image. Keep in mind as you use these tools that unlike Photoshop's other selection tools, we're not adding to, or subtracting from, the actual selection itself with these tools. We're simply adjusting the size of the area that Photoshop is analyzing. Photoshop determines which pixels to select and which to ignore. We're just telling it where to look and where not to look. Holding down Alt (Win) / Option (Mac) and painting along the bottom of the image. With Show Radius turned off, we switch back to seeing the image in the document window. To add more of the woman's hair, I just need to paint with the Refine Radius Tool over the area where her hair should be. But how do I know where to paint when I can't actually see the rest of her hair because it's not currently part of the selection? It would be helpful if there was some way to temporarily view the entire original image so I can see exactly where I should be painting. Thankfully, another of the Refine Edge view modes - Reveal Layer - let's us do exactly that! Choosing Reveal Layer from the bottom of the list of view modes. Reveal Layer shows the original image without any selections. Now that I know where to paint, I'll press the letter L on my keyboard to switch back to the On Layers view mode, then I'll begin painting with the Refine Radius Tool to reveal more of the woman's hair. Just like any of Photoshop's other brushes, we can change the size of both the Refine Radius Tool and the Erase Refinements Tool directly from the keyboard. Pressing the left bracket key ( [ ) will make the brush smaller, while the right bracket key ( ] ) will make it larger. The gray background from the original image is visible while my mouse button is held down. 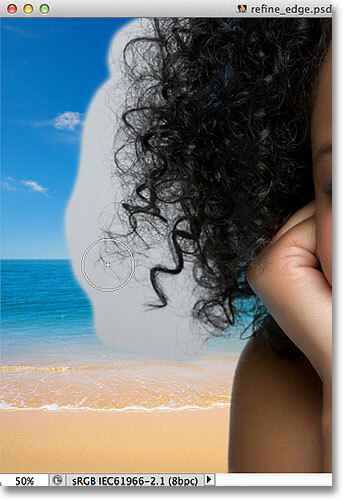 More of the woman's hair now appears in front of the new background after painting with the Refine Radius Tool. Below the Edge Detection options in the Refine Edge dialog box are the Adjust Edge options - Smooth, Feather, Contrast, and Shift Edge. All four of these options are set to 0 by default and when using the Refine Edge command for selecting hair, it's usually best to leave at least the first three options (Smooth, Feather and Contrast) set to 0. 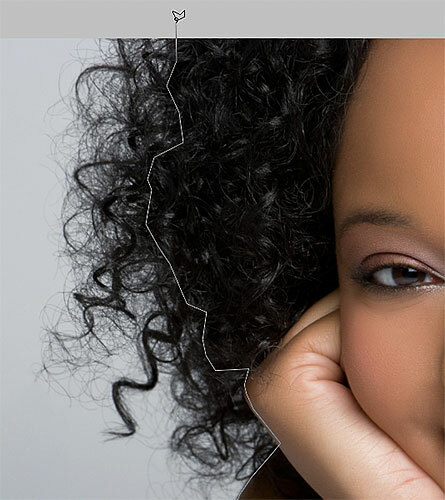 The Smooth option is used for smoothing out jagged selection edges, but it usually causes problems when selecting hair. The Feather option will blur the selection edge which just makes things look soft, blurry and unprofessional. And the Contrast option will attempt to sharpen up selection edges by boosting contrast, again not something that usually works well with hair. Increasing the Shift Edge value to expand the selection edge outward. Increasing the Shift Edge option added additional hair detail to the image. Selecting the Decontaminate Colors option. Increase the Decontaminate Colors amount to remove fringing around the hair. The image after removing the fringing with the Decontaminate Colors option. Selecting "New Layer with Layer Mask" for the Output To option. 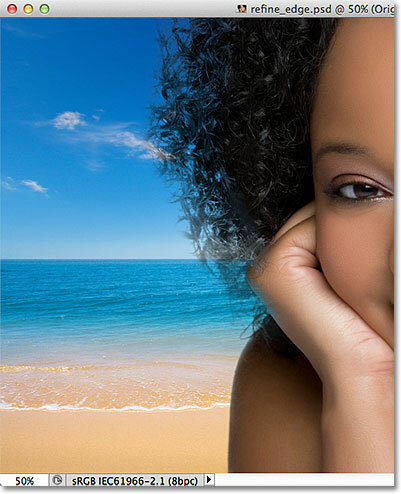 The Layers panel showing the layer mask on a copy of the original image. 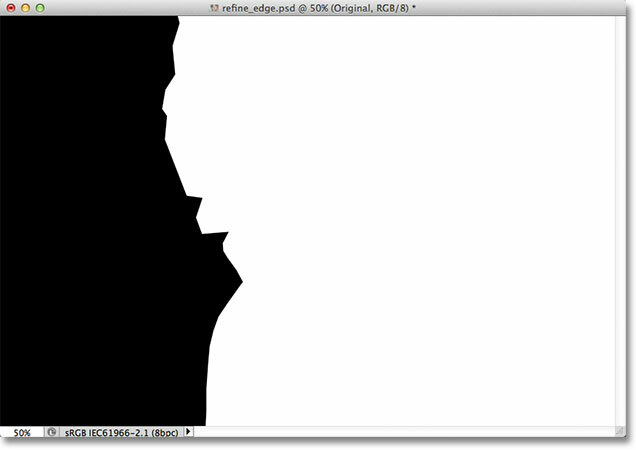 Hold down Alt (Win) / Option (Mac) and click on the layer mask thumbnail. Painting with white (using the standard Brush Tool) to clean up a few areas of the mask. Clicking on the preview thumbnail to the left of the mask thumbnail. And there we have it! That's how to select hair in a photo using the powerful Refine Edge command in Photoshop CS5! 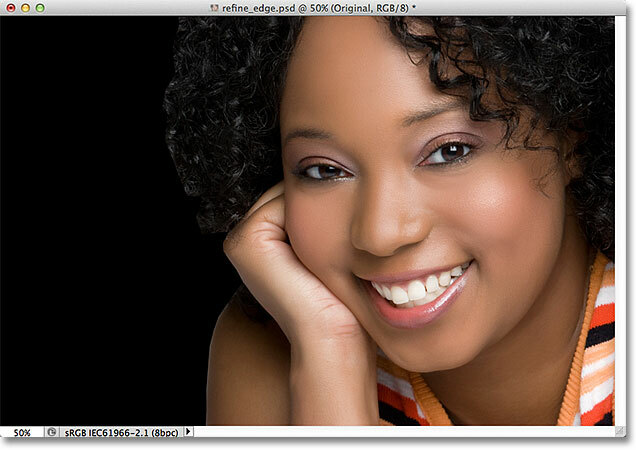 For more about Photoshop selection tools, see our How to make selections in Photoshop series. 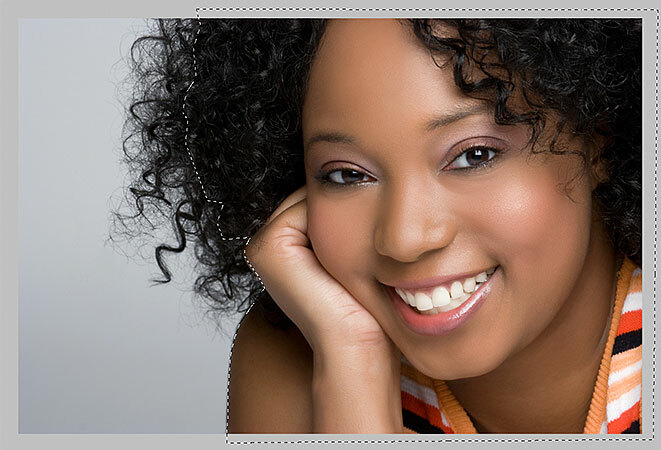 Or visit our Photoshop Basics section for more Photoshop topics!